Information for the 2020 race will be published towards the end of this Summer once dates for the venue availability have been obtained. With apologies for the delay, the full results may be found here. A big thank you to all who took part whether running or helping. starting as in 2017 at the Chelmsford City Race Course. • 10:30am, Sunday 31st March 2019. Don’t forget the clocks change overnight! • Runners car park via the main entrance on the A131. • Route description & map below. This event will form part of the 2019 Essex Road Championship Race series, see here. same year (eg. Suffolk / Kent,etc). We have full ‘Chip to Chip’ Timing provided by ‘Nice Work’. All Race Numbers with Chips attached are to be collected on the day. Please allow plenty of time on the day to collect your number from race HQ. No refunds, please contact us for transfers. No transfers will be possible after Thursday 28th March 2019. All Parking will be available at Chelmsford City Race course Main Entrance. Please do not use the side gate. The use of ipods, mp3 players etc by competitors contravenes UKA rules. Anyone using these devices during the race will be disqualified. We also reserve the right to not provide a T-shirt to anyone disqualified for this reason. We are unfortunately unable to cater for wheelchair contestants. Minimum age of 15 on race day. No accompanying dogs or cyclists. Toilets, Refreshments and Bag Drop are all available in the Main Grandstand. On-the-Day information will be published here shortly. Please watch this space. 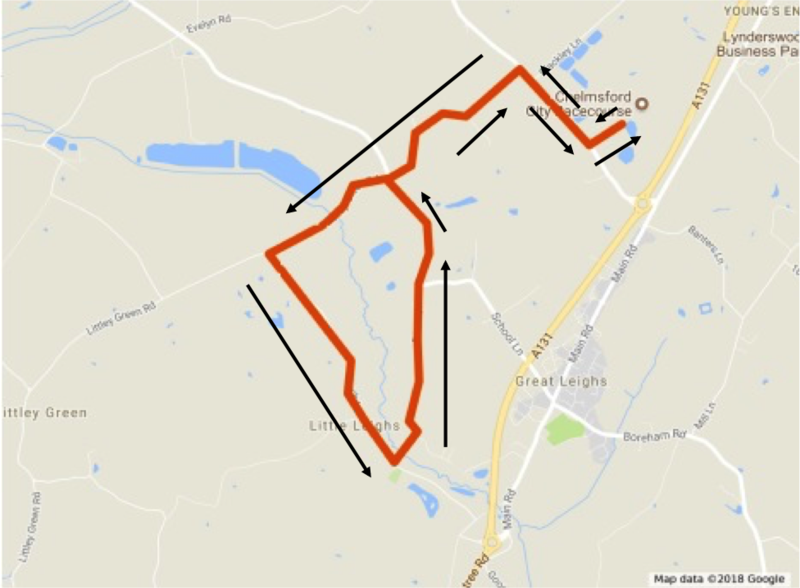 • A fast, undulating, rural, all road course, see map here. The start of the race is approx 50 metres from the Main Grandstand. Please refer to the course map and follow directions from Marshals. Our Race Director, Claire Blake. But see above for entry information. Club members, relations & friends: please contact Ross Boyer if you can offer help with marshalling on race day. It will be an exciting day out! •Commemorative t-shirt to all finishers. •Presentation ceremony shortly after the race. Whilst we will endeavour to provide a T-shirt of the correct size we will be unable to guarantee this for entries received after 03/03/2019. Thank you to all who ran, all who helped and all who supported the race. We hope you all had a most enjoyable time and that you are pleased with your results which are shown here. The results can be found here and for more on the race, see the B5 Facebook page. For once the weather forecast was correct and the morning of the 7th Braintree 5 race was cold but bright. A frosty start for all those up at the crack of dawn to put out the various signs, sort chips, set up marshals and Start/Finish turned into a warm morning with around 374 runners turning up for the start of the Race at 11am. After 25 mins 50 secs Scott Cousins was the first over the line for Springfield Striders Running Club. The first female home, Samantha Bilbie in a time of 30 mins 59 secs was also running for Springfield Striders. Very soon the rest of the runners followed and the finish line became a sea of orange as the runners proudly wore their Finishers t-shirts. With just the clearing up and posting of times to complete, another Braintree 5 race ended on a high note with success all round for a well organised day. Paul Miller wishes to thank all the helpers. Without the vast amount of help in whatever form the Race would not be able to go ahead. Whether you were marshalling out on the road, putting out signs, or one of the other many helpers, you all played a vital role ensuring the smooth running of the event. You will appreciate that many months of planning go into the Race every year and it is only on the day that all the pieces come together to make what was a great race. He is standing down as Race Director and says that it was a great day to finish on and thanks you all for making it a special day. He hopes you will all continue to support the race and its new Director. Here are the winners! Full results here (PDF). BRA The Breast Reconstruction Awareness Charity. No 1048542. The Friends of The Flitch Way. Charity No 1115617. After months of planning, the day was finally upon us and the Braintree 5 was here. A very early start with an hour’s less sleep saw the B5 team set up the start, finish, registration and the course.The day had started very drizzly and grey but gradually the runners braved the awful weather and made their way to the start line on the Skyline 120 Business Park to take part in the 6th Braintree 5 Race. A slightly smaller field than usual, due to a combination of clashes with other events coupled with the weather, started dead-on 11am. Led by our Lead Bike rider Scott the strong field of runners were cheered on by our ever faithful band of supporters and Marshalls. All 300+ starters completed the course and although we had the First Aid team to hand I am pleased to report that their services were not needed. By 12.15 all runners were over the finish line along with Gary Sibley who acted as our Sweeper for this event. Goody bags and shirts were gratefully received, the need for a dry T-shirt being the most urgent with the majority of runners having contended with a very heavy shower of rain in their final stage of the Race. Finally Presentations were made in the Discovery Centre by our Chairman, Tony Gordon, and once again the Braintree 5 Race was over for another year. With our thanks as usual to Countryside Properties for giving us permission to start and finish on their Skyline 120 Business Park, the staff at the Discovery Centre for their co-operation in the organising of this event, and our members and their friends, family and colleagues who turn out in all weathers to marshall, support and organise this event. Results can be found here (pdf) and photos, courtesy of Andy Sheridan Photography here. Parc Essex. Play & Resource Centre. Charity No. 1065854. After what seems like a never ending winter the sun finally made appearance and the scene was set for a wonderful 4th Braintree 5 mile race. Temperatures were around 10 degrees and bright and sunny throughout. Results are available at http://www.triandenter.com/race-results/2014-race-results/ and here as a PDF file.